This guide offers a comprehensive description of the basic principles of applied budget work, examples of useful resources, and best practices. 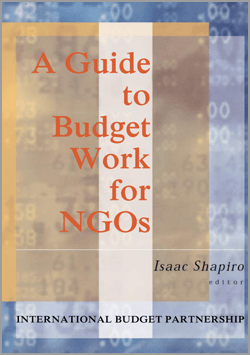 It provides a systematic overview of the different aspects of effective budget analysis, with an emphasis on the activities and approaches a nongovernmental organization might want to undertake in its initial years of budget work. The guide is primarily intended for groups or individuals that have a new or relatively new interest in budget work, but it also may be of interest to those that have engaged in budget work for some time and are interested in a review of the basic principles, examples of useful resources, and best practices.